Next month, millions of kids will retrieve their baseball and softball gloves from the bottoms of drawers or from under their beds. After a trip to the store to get some new cleats (after all, their feet have grown since last summer! ), they will take the field for another Little League season. This is a Spring rite for kids, shallowly rooted in recent history, but often deeply rooted in family dynamics. Founded 1938 in Williamsport, Pennsylvania, Little League Baseball expanded rapidly throughout the United States and Canada. By the mid-1950s, Little League Baseball was fully established as a major institution with 4000 leagues in the United States, and further growth into Mexico and other nations. Unlike in my day, when all of the kids playing Little League were boys, there are now a substantial number of girls playing. Today, LLB/S is an organization that boasts 2.7 million children participants worldwide, 2.1 million of them in the United States.There are 176,786 teams in the program, 153,422 of them in baseball and 23,364 in softball. But the dramatic growth of girls on the field has not been matched by a growth of women coaches. In the community I studied for eight years — South Pasadena, California — only 2% of boys’ baseball teams were coached by women, while 11% of girls’ softball teams had women coaches. I discovered that prospective women coaches faced barriers—mostly informal and unspoken — that diverted them away from coaching. Most of the few women who did coach left after a year or two, after finding the league to be dominated informally by a less-than-supportive “old boys’ network” of coaches. I came to see this as a problem. One coach I spoke with asked me with alarm whether my research was aimed at creating “quotas” of women coaches. If so, she warned, this would be a very bad idea. What kids need most, she said, are good, knowledgeable coaches who are committed to the well-being of the kids, regardless of whether the coaches are male or female. Athletic women are a largely untapped community resource.Today’s generation of mothers is rich with athletic experience and talent. Many women, I have found, want to coach their kids’ teams. But all too often they are channeled away from coaching,into non-coaching support roles like “team mom.” Tapping in to this growing talent pool of athletic women will benefit our communities and our kids. It’s good for families.What adults do in youth sports is linked to what we do in other realms — especially families. There is currently what many have	called an “unfinished gender revolution” in work and family life. For instance when dual-career families start to have children, it is a common practice to shift the burden of	breadwinning on to the shoulders of the father, and housework, childcare and community volunteer work on to the shoulders of the mother. 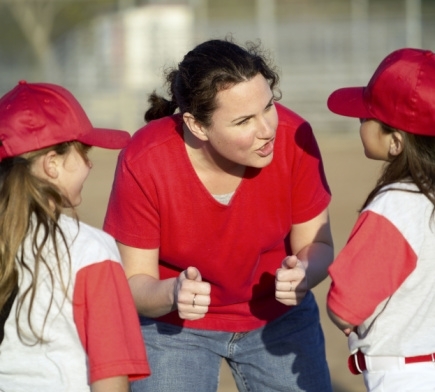 While this choice is often made because of the inflexibility of workplaces and occupations, it is further reinforced by a skewed gender division in youth sports coaching, one that symbolically positions the man as the team’s leader, and the women as the supportive “team	mom.” Greater gender equity among parents in youth sports coaching will reverberate into family life. It’s good for boys. Today’s boys are moving into a world where they will be working with women co-workers, and even women	bosses. In preparation for the world they will inhabit as adults, boys need to see and experience the full range of women’s leadership and physical abilities. In subsequent blogs, I will share some of the secrets and strategies of successful women coaches, and will share a list of things that youth sports organizations can do to recruit, support and retain more women coaches. Michael A. Messner is professor of sociology and gender studies at the University of Southern California. His latest book is It’s All For the Kids: Gender, families and youth sports (University of California Press, 2009).